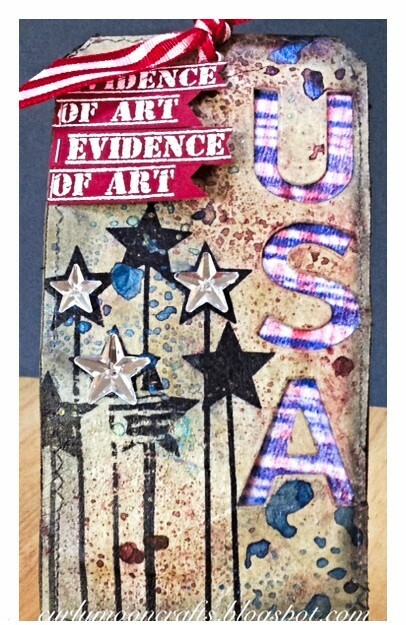 Hi Friends: Today's creation is a tag to celebrate the 4th of July. I used the 2 techniques for the June 2016 Tim Holtz tag (Tissue Wrap Collage & Stencil Plaid) with the SSS Tic Tac Toe diagonal for Spray, Stamp, Stencil. Since I don't have all the supplies for Tim's tag, I had to improvise a bit. The tag top was cut from Grunge Paper with the Tag & Bookplates die. Since I wanted to do a 4th of July theme, I stamped the stars from the Wendy Vecchi Celestial Art set onto plain tissue paper with Archival Jet Black ink. I used the Vintage Tim Holtz Distress Collage Medium to attach the tissue paper to the Grunge Paper. I sprayed blue and red colored LSG and Tattered Angels sprays to create the "fireforks" on the tag. For the Stencil Plaid, I used the Tim Holtz Stripes Layering Stencil with Distress Inks in Candied Apple and Blueprint Sketch to create the plaid on a scrap of old t-shirt material. I used the Merry and Bright QK die set to cut the USA letters from the tag, then glued the plaid material behind the letters. I created the "flag" at the top by stamping the Evidence of Art stamp with Versamark ink onto red cardstock, then heat embossing with white embossing powder, and cutting into strips to fit the tag. I backed the tag / material with another tag, then finished off with some machine stitching, edging with Black Soot Distress Ink, a few Mirrored Stars and some ribbon from my stash. I created the flag at the top by stamping the Evidence of Art stamp with Versamark ink onto red cardstock, then heat embossing with white embossing powder. Thanks for taking a look. Happy 4th! What a great 4th of July tag! The stars are perfect. Love your 4th of July tag! Great idea to use the mirrored stars! So cool. So clever. Makes me smile. Happy Independence Day to you! Congrats to you! How fun! LOVE the Wendy stars and the USA!!! This is amazing! What a fantastic take! Very inspiring, TFS! Biggest congrats on your win with this awesome tag! Yeah! I'm so happy your tag was picked as a winner! So far 5 people I picked to win are winners! Love when that happens! Happy 4th! Love your patriotic inspiration. Wonderfully done! I love those stars on your tag! Great design in honor of the 4th of July. Great job! Thanks for joining us on the Simon Says Stamp Monday Challenge. Fun tag!!! Congrats on your win!! Great tag and Fabulous holiday to honor! Congratulations!